This excellent text is designed to be an easy-to-read, practical guide for practitioners and researchers requiring an accessible reference text on digital signal processing. The book is split into six self-contained chapters, allowing the reader to quickly locate and implement different aspects of the subject as required. The authors primarily introduce the concept of signal processing, providing information on types of signals, transformations (for example, the Z-transform), parametric and nonparametric characterizations, and analog to digital conversions. Next, they present the fundamental concepts needed for understanding systems using signal processing, like linearity, stability, stability, convolution, and linear system representations in time and frequency domains. There is also a description of the concept of noise and its significance in such systems. The following chapters are on digital filters (including popular digital filters, moving average filters and adaptive filters), fast fourier transforms and the realization of digital filters, such as fixed-point implementation and pipelining. Finally, a chapter on case studies and research topics, like target tracking, frequency estimation and demodulation of FSK signals, gives the reader real-world examples of digital signal processing. 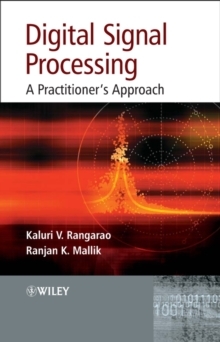 It includes practical text to cater for the needs of a practitioner who wishes to understand and implement digital signal processing to suit his/her requirements. Each chapter is self-contained, clearly outlining the fundamentals of a topic and allowing the reader to quickly identify and implement necessary information. Section on case studies and research includes worked through problems on target tracking and frequency estimation, as well as practical information on fitting a sine curve and demodulating BFSK signals. Introductory chapters covering basics such as the concepts of signal processing, transformations, parametric and nonparametric characterizations, linear systems and noise make this text a useful reference point for beginners to the subject, as well as more advanced researchers and practitioners. This text is ideal for practising engineers and researchers developing digital signal applications, who require an accessible reference text or introduction to the subject. It is also suitable for Electrical and Computer Engineering graduates taking courses in signal processing or digital signal processing.